Ross Morley, Managing Director of G. J. Gardner Homes has been supporting our native environment (through Fifteen Trees) since 2013 and has now helped plant over 44,000 trees across Victoria and Tasmania. For every new home built, Fifteen Trees organises the planting of 15 trees in the local district. This year alone the project will see over 11, 000 trees planted by schools, landcare and various environmental groups. Garry Cox and Gill Hardman from G. J. Gardner Homes Base Coast are generous supporter of local community groups and their tree planting projects. This year, the Cowes team purchased 405 trees for the Phillip Island Landcare Group. The trees were planted at a bran-new primary school called Our Lady Star of the Sea. What a beautiful name! Kids and trees at Cowes. We have planted the trees as a part of the G.J. Gardner Homes and Fifteen Trees project. They were planted at a school that has just been set up. It is called Our Lady Star of the Sea school at Cowes. 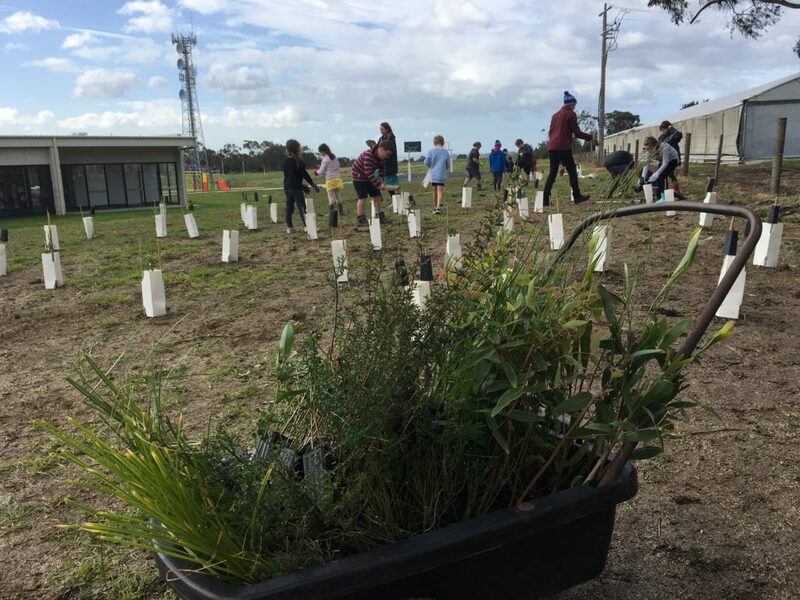 It’s a new school and the school community undertook a planting day on their school grounds. This is the first year this school has been operating and they have been doing a lot of work to get the landscape looking good. Thank you G.J. Gardner Homes for all our trees. Over time this landscape will become a well shaded adventure playground for our students. Shout out to Garry and Gill from G.J. Gardner who generously purchased the trees for Our Lady Star of the Sea. This company takes its social corporate responsibility (CPR) seriously and aims to do good locally. Thank also to Geoff for finding such a great home for our trees. We look forward to visiting the trees when next we pop over to Phillip Island for some sand and waves.